These recipes sound delicious, Rhys; I can’t wait to try them! Thanks for sharing . . . .
Chicken on the grill, asparagus, salt potatoes, salad from the garden. Could you get me a half gallon of 1% while you're out please? Thanks in advance. Hank, since we didn't do burgers last weekend, we're having them tonight. It's cooled off today so really looking forward to grilling on the deck this evening. The ground beef is from our local farm shop and the tomatoes are heirloom Cherokees from yesterday's farmer's market. When my husband returns home to live here in a couple of weeks, I'll start having more regular meals, which is both good and bad. He's been living elsewhere for years, so I've gotten out of the habit of wondering what we're going to make for dinner. I do look forward to the grilling and eating better, but my irregular schedule of eating whenever I want will be missed. Tonight I'm having left-over spaghetti made with linguine from eating out. Dinner? Steak with caramelized onions and sweet peppers, warm potato salad, green beans with bacon and garlic butter, and a nice glass of wine . . . .
Yum and Yum! Can't wait until we have fresh tomatoes this season to try this! These sound delicious, Rhys. The wonderful food descriptions in The Tuscan Child made me hungry! 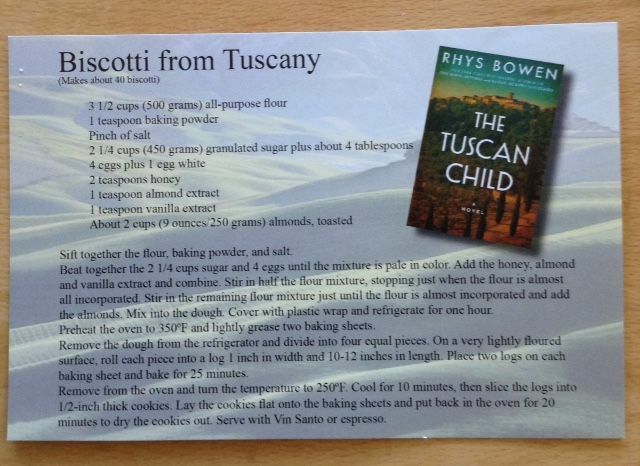 The biscotti recipe is a nice gift from Tuscany, Rhys. Thank you! It's something I've never tried before. Wish I had some Vin Santo to go with it. Tonight we'll use leftover steak in burritos, with some of our own homegrown lettuces. I grew six different kinds (accidentally, long story), and it's been so good this year. We've had social evenings four nights in a row, and we're both looking forward to just chilling out in the backyard. Rhys, all I wanted to do while I was reading The Tuscan Child was cook what they were making! Maybe you should do a little cookbook to go with the book! LOVE tomato bruschetta, and I've discovered the best bread at Trader Joe's--a half round of 100 % whole wheat artisan sourdough, Pain Pauline. It makes great toast and bruschetta. Love Bruschetta. A super-simple version is my go-to emergency appetizer plate during the summer: good bread, good olive oil, and a can or two of Italian style diced tomatoes. Sometimes I'll throw shaved parmesan on top (one of my pantry staples) to disguise the fact the tomatoes aren't fresh. Another pantry staple is olive tapenade, which also makes a great quick treat. 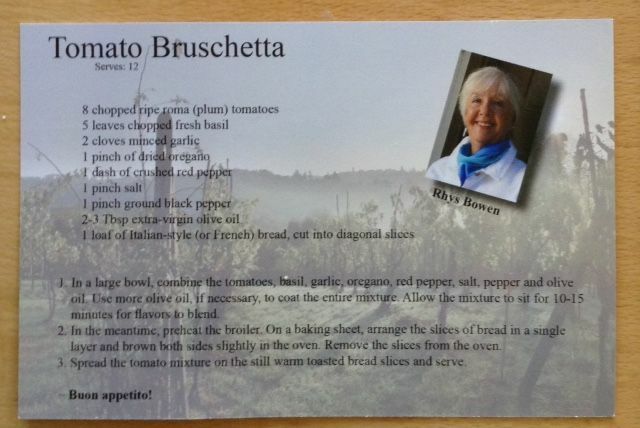 The Bruschetta recipe I might try, as I do enjoy it, and it would be a great summer treat. The biscotti is something I think I'll leave to the experts. I've always considered it more of a work of art from those who really know how to make it. Kristi Belcamino makes a mean biscotti, and I can't imagine me trying to match that. So, I'll leave your recipe to the master biscotti makers, Rhys. Rhys, I heat bruschetta. That is a wonderful summer treat. I visited Tuscany years ago and we ate similar food. I remember the village of San Gigiamano (sp?) and it is the same town pictured on your Facebook page. Thank you for sharing the recipes.